Recognise those sweets on the right? Yes, flying saucers of course. Did you know they have been the UK's favourite retro sweet for many years? 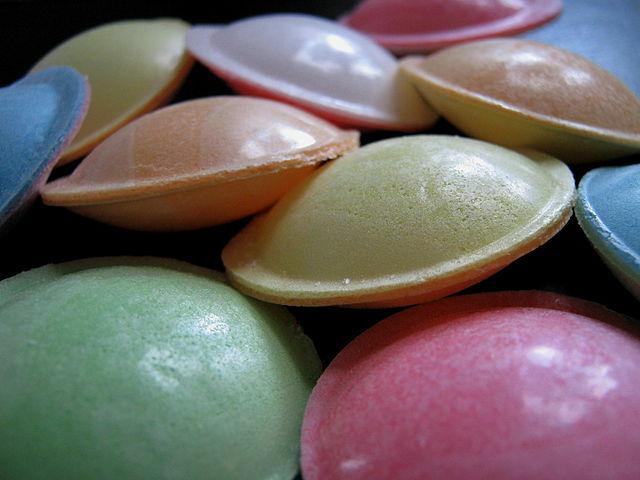 First introduced in the 1960's by the Belgium company Astra Sweets, flying saucers have been a staple for children through the 60's, 70's and 80's. Perhaps today their main consumers are adults? Other strong favourites among British sweet shoppers are kola kubes, blackjacks, rhubarb and custard, nerds, sherbet fountain and bon-bons. All of which are still available today. You can find Britain's Top 10 favourite sweets here. Cadbury's Flake has become as iconic image around the world, in part due to its unique texture but mostly due to the advertising campaign launched in the 1970's. American sweets are often imported by specialist sweet shops as many popular brands in the USA are not officially imported to the UK. Pick and Mix didn't end with Woolies. You can still get your favourite sweets on-line in any combination and quantity you like.